Converting from a RIP style install to a package installation-errors? 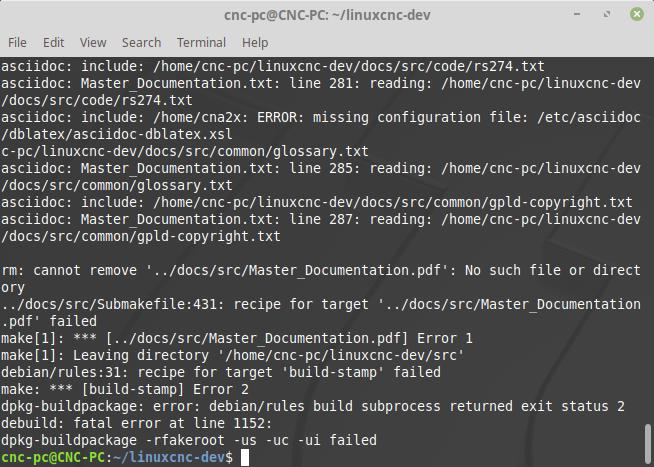 SO I am following the instructions for installing the realtime Preempt-RT kernel and LinuxCNC on Linux Mint 19 with Cinnamon DE. I had a few hiccups here and there but the RIP installation works. Latency is still too high to suit me, but I have a LOT of things to work on there. I've tried creating a file named Master_Documentation.pdf, but it doesn't help anything. There is no .pdf in the directory, just .txt and .xml files. What can I do about this? Replied by AnnoyingMutt on topic Converting from a RIP style install to a package installation-errors?